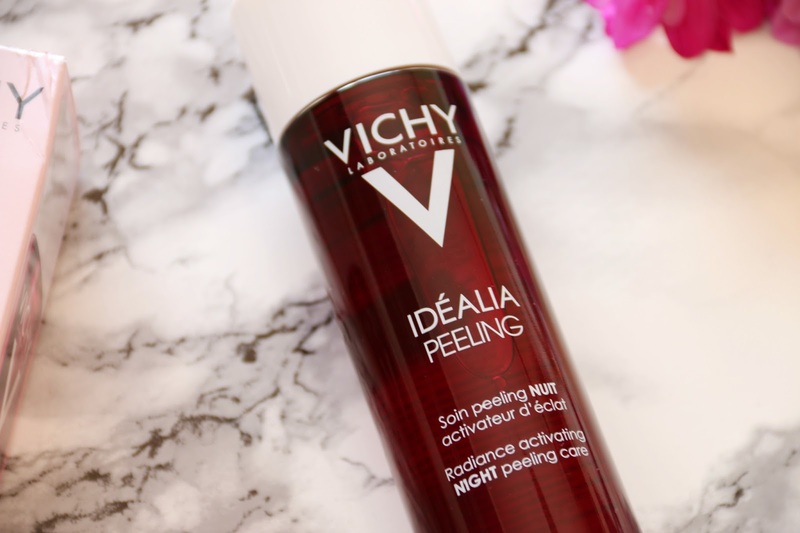 VICHY Idéalia Peeling: Perfect Overnight Peel for Sensitive Skin! 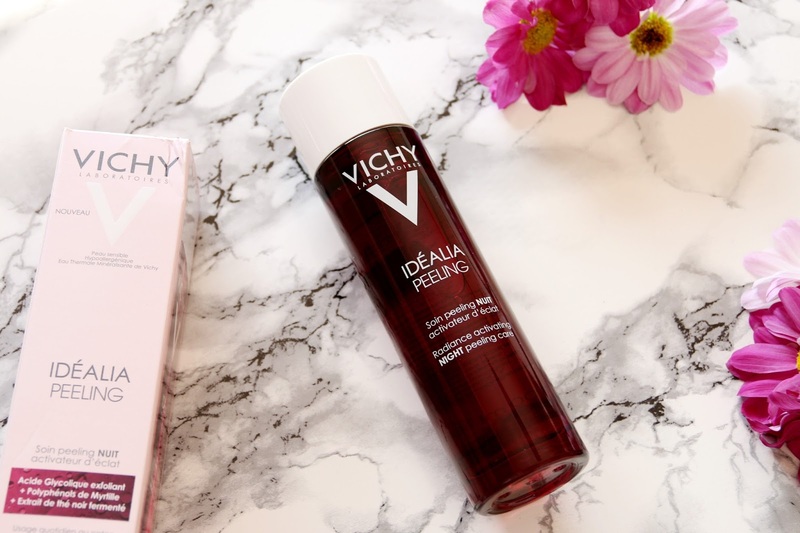 French skincare fave VICHY, the number one anti-ageing brand in European pharmacies, have launched the first hypoallergenic overnight liquid peel that is suitable for all skin types, even those with sensitive skin! 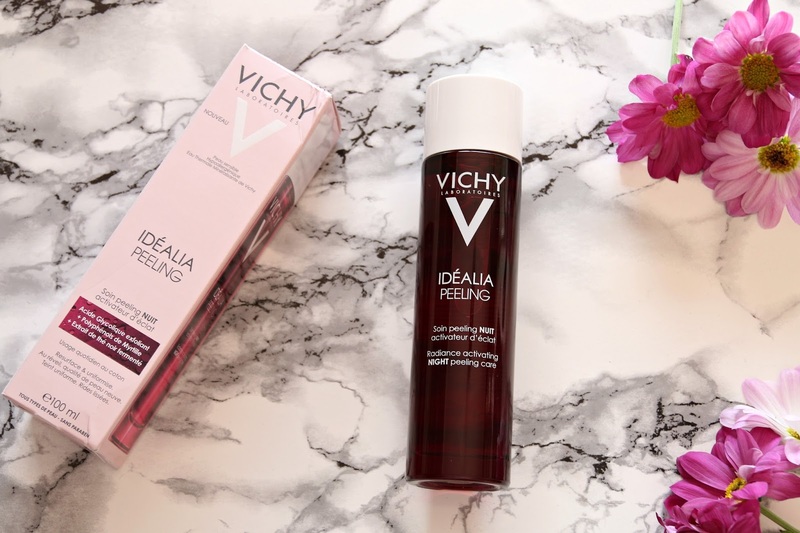 VICHY Idéalia Peeling is designed for the modern day young woman who typically burns the candle at both ends while leading her fast paced lifestyle. Early morning meetings, late nights out and weekends spent partying don’t leave much room for sleep and that excess, together with other lifestyle factors and the environment can show on the skin. I can always tell when I haven’t been getting enough rest or when I am feeling exhausted and stressed as it shows in my skin with it looking lacklustre, dull, drained and quite honestly, a lot older than its years thanks to an increase in dehydration lines and zero radiance! Through skin research, VICHY has found that the effects of stress and exhaustion have led to the phenomenon of cutaneous exhaustion. This is said to be where the skin mirrors the effects of lifestyle factors on the body and I have to say that I totally believe in it from the effect that I have seen stress and exhaustion have on my own body. Through cutaneous exhaustion, damage to the skin’s lipids, proteins and DNA is caused and there is a decrease in cell renewal too. VICHY Laboratories have identified what they claim to be the three main physiological factors that are responsible for skin’s exhaustion; oxidative stress which causes changes to cells and molecules and therefore reduces skin quality, glycation which makes the skin look more dull and metabolic disorders which affects the cells energy production and creates a vicious circle of oxidation in the skin. All of which, VICHY Idéalia Peeling helps to combat. Idéalia Peeling aims to combat exhausted skin, activate radiance and restore the skin’s optimum glow overnight in what is the latest addition to their ‘life-proofing’ skincare range. It is an overnight skin peel that performs as an antioxidant rich supplement to refine, renew and reenergise the skin. The unique water-light formula has the power of a serum to refine pores, improve the surface texture of the skin and smooth fine lines. It aims to do so in only 4 weeks while improving the quality of the skin and giving it a more radiant appearance day after day. Idéalia Peeling is an acid peel, with 4% Gylcolic Acid and 5% Hepes, that is unlike any out there on the market because it is designed to be used on even the most sensitive of skin types. Its gentle formula contains 5 key natural extracts; antioxidant rich Blueberry Polyphenols which counteract the effects of oxidative stress, Kombucha Tea Extract which helps to restore the skin’s quality with its anti-glycation action, Hepes which is an active ingredient that works as an exfoliating agent to help to shed the excess, dead skin, Glycolic Acid which also exfoliates the skin and helps to improve the softness, brightness and luminosity of the skin and finally the 15 mineral enriched VICHY Mineralising Thermal Water, which is clinically proven to strengthen the skin’s barrier function and accelerate surface skin cell renewal… all while being gentle on the skin! I’ve tried chemical peels in the past as a way of exfoliating my skin but I’ve always gone back to manual abrasive exfoliators as the acid ones have either been too harsh for my skin or not as effective. I could get on board with the Nip and Fab Glycolic Fix Pads but the Pixi Glow Tonic is one of the most awful products I’ve ever put on my skin. It works so incredibly well for so many people but it broke me out horribly; I’m talking big deep, purple scaring spots. I tweeted them and they recommended using it less frequently and atop a cotton pad soaked with water but it still didn’t have the amazing effect that it has on others skin unfortunately. Then I reluctantly tried the VICHY Idéalia Peeling and the game totally changed. Sure enough, I read that it was suitable for even the most sensitive skin, having been tested on sensitive skin under dermatological control but I was still skeptical as to whether it would work for me or not. It absolutely does! The VICHY Idéalia Peeling liquid is absolutely fabulous; easy to use, super gentle and with no negative side effects. From the very first use, I noticed a difference in how radiant and healthy my skin looked and after a few weeks of use, I found that my skin looked smoother which benefits my makeup application too, more youthful and naturally perfected which is the reason I have continued to use it. Especially with summer coming up, I like to wear as little makeup as possible so having my skin look its best is even more important to me than usual and this overnight peel really helps with that. Unlike many other peels that are designed to be used once every few days, once a week or only when applied by a medical professional, Idéalia Peeling is gentle enough to be used at home, daily. To apply, simply remove all makeup and cleanse the skin, then apply Idéalia Peeling to a cotton pad and sweep over the skin before applying your chosen night cream. It doesn’t sting, hurt or leave the skin feeling tight or itchy. Something that I love the most about Idéalia Peeling is that it is advised that you apply your night creams after using it which ensures that it doesn’t dry the skin out. Since the night peel works as like a serum, which again is unusual for products like this, it helps to draw any products that you put on top deeper into the skin. By increasing the penetration of serums and night creams, they work more effectively and you really get the best out of them. I’ve been using my trusted Estée Lauder Advanced Night Repair Serum and By Terry Baume de Rose Face Cream (review here) over the top of Idéalia Peeling most often and I feel the benefit of their hydrating and renewing properties even more with this combination. I would highly recommend VICHY Idéalia Peeling as I’ve seen such fantastic results from it. If you want glowing, gorgeous skin, pick up a bottle from Feel Unique, Look Fantastic or Beauty Expert. How does this sensitive skin wonder product sound to you? What other VICHY products would you recommend to me? Why do you think some women are motivated to try these type of beauty products? I think aging is a beautiful event. I think I definitely need to give this a go. My skin is definitely suffering from the sleepless nights of life with a baby. Really going to give this a go, i have been looking at peels lately as my skin is looking grey! This is the first time that I heard about this product and it really looks Interesting for me, I would love to give it a try. Ive always been a little bit scared of chemical peels but it is great to know that you found the Vichy one nice and gentle. I've heard great things about face peels, they seem to make your skin feel great! May need to try VICHY out.